The Nereid Thetis is borne across the sea in the arms of the Ichthyocentaur (fish-centaur) Bythos. She is accompanied by her mother Doris and sister Galatea. Bythos (Sea-Dephs) is depicted as a red-skinned sea-god with crab-claw horns and the lower body of a fish-tailed horse. The Nereids wear billowing cloaks and are crowned with shining aureoles. 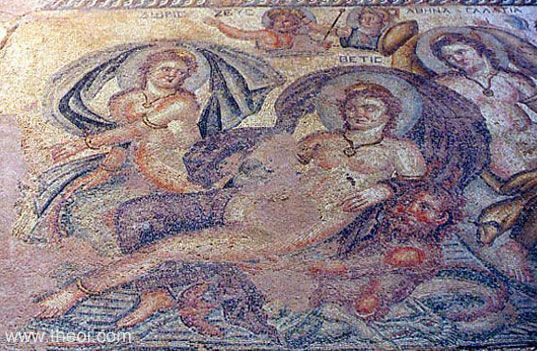 The figures are labelled on the mosaic in Greek.